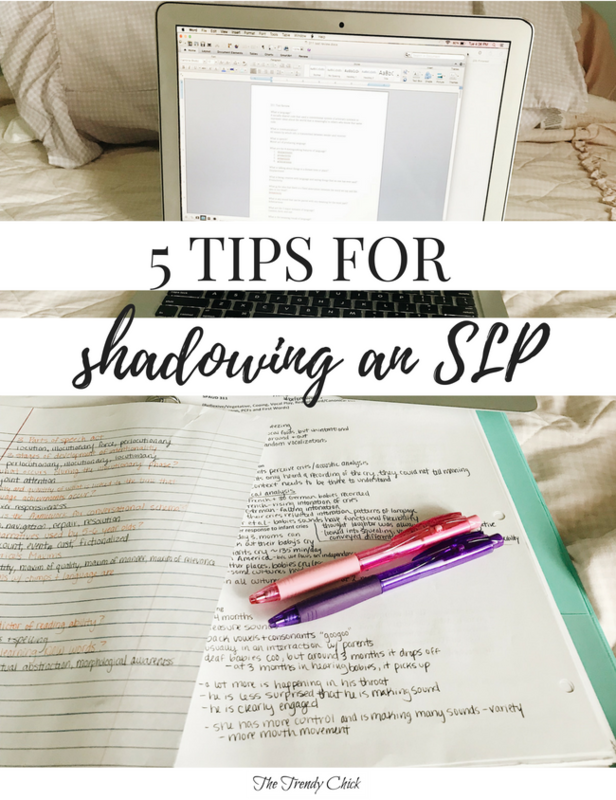 Now that I have had a full year of observing under my belt, I wanted to share a few things I have learned from shadowing SLPs! Last fall I shadowed an SLP with a 10 year old client with articulation problems, and this past spring I observed an SLP with an elderly lady with aphasia. I have also observed in a few other settings as a one time thing, but each of these were weekly. Whether you are observing just once or observing on a regular basis, there are a few things you should know beforehand! Especially if you are observing a setting you have never been in before, I am sure you will have some questions before or after! You can ask what they like about being an SLP, what they dislike, why she chose the setting she is in, etc. If you have something specific to ask about something she did with the client you were observing, wait until after the session is over and ask. Use this opportunity to take notes about what you are observing! If you are observing for school, you might also have to write a SOAP note afterwards, so you will want the data from the session as well. To be on the safe side, do not wear jeans, open toed shoes, revealing clothes, or clothes you can’t move around in. Especially if the client is a child, you might have to get on the floor and move around a lot during the session! Many facilities also require closed toed shoes, but the clinic at my school doesn’t. But if you are unaware of the requirements, it is better to be safe than sorry! Black pants, a nice blouse, and a cardigan would be a great choice to keep it safe! Some clinicians will want you to help out during the session and be involved while others will prefer you stay quiet. Unless they specifically tell you to do something, it is best to stay quiet and just observe what is happening. This can be hard if you’re excited, or as you get more experience you may want to jump in with a thought or opinion. But as I mentioned earlier about the questions, do not interrupt the session unless the clinician specifically asks you something! If you are observing to get to your 25 observation hours, make sure you record your hours! My school has a specific sheet of paper they give to us to record hours, so I make sure to record my hour after every session I observed. If you don’t keep up, it can be easy to forget to add in an hour or two! Let me know in the comments if any of you are in school to be an SLP too!